Often located in remote areas far away from cities and even villages, Russian monasteries have always had to produce much of their own food, and many monks and nuns continue these traditions today, with some monasteries playing an important role in supplying regional stores with fresh bread, honey, and even Italian-style cheese. Typically living in isolated communities far from cities and towns, monks and nuns have always had to practice the art of self-sufficiency – before the arrival of the 20th century and modern transport, most monasteries would have to produce enough food during the summer months to last them all winter. In many ways, little has changed: Many Russian monasteries have their own husbandry and even those monasteries that are located in cities have farms in the country. Most have gardens, some even apiaries, but mainly the monasteries are known for their bread and dairy products. One hundred kilometers from Moscow stands the Serpukhovsky Vladychny Monastery, a convent founded in the 14th century. During the Soviet period it was abolished and reopened only in 1995. "We've had auxiliary facilities since we opened the monastery," says Mother Superior Alexeya. First the nuns acquired goats, then cows. "And when there were a lot of cows, we said: Where are we going to graze them? Our acquaintances offered us some land in the neighboring region." Currently, the Serpukhovsky female monastery has 25 dairy cows. Fresh milk is brought from the farmstead every day. The nuns use it to make sour cream, cottage cheese, kefir and yogurt. Mother Superior Alexeya says that everything is usually eaten in the monastery, and only in the summer, when the cows produce a lot, is the extra milk sold to the parishioners. Besides cows, chickens and ducks can also be found in the monastery. The nuns also plant potatoes and all possible vegetables. "Beets, carrots, potatoes - this all grows in our village," says Alexeya. "But also tomatoes, cucumbers, zucchini, eggplants. For some reason melon did not grow this year – but there was some good watermelon. We have many seeds now – we have cultivated an interesting yellow watermelon." A look inside the monastery cellar reveals that the nuns like to stash away food for the future. In the summer they can tomatoes, cucumbers, and mushrooms, packing the cans with vegetable salads, with and without oil (in case of Lent), and make compotes and preserves. In the Serpukhovsky female monastery they also bake bread. "In 1999 a Swiss charitable organization gave us equipment to bake bread," remarks Mother Superior Alexeya. She says that, unlike the dairy products, bread is also baked to be sold. This bread can be bought in the nearby town of Serpukhov, as well as in some stores in Moscow. The monks of the Holy Danilov Monastery, whose history dates back to the 16th century, also bake bread. The monastery is located in Moscow and is famous for being the residence of the Patriarch of Moscow and all Rus, Kirill. Here bread is baked on a professional level. 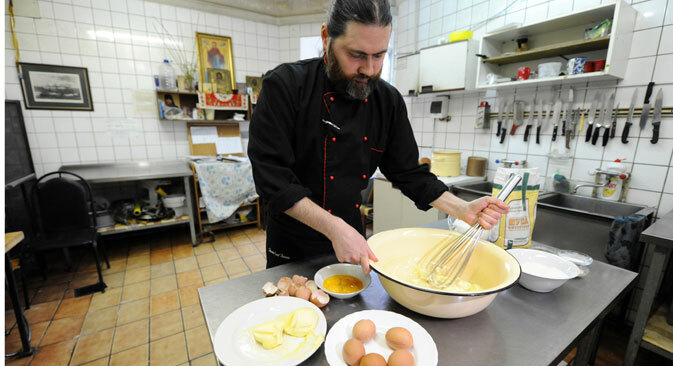 "We began working with 50 grams of flour a day," says the monastery's cellarer Theognost, who is responsible for preparing and preserving the products. "Currently, in one day we work with half a ton. With this amount of flour we produce almost 2,500 loaves of rye bread daily, and almost 2,000 loaves of white bread." The Danilov monastery also produces about 12 types of pies, and two years ago the monks opened a facility for baking cookies. "We even have our own brand," says Theognost proudly. Twenty people work in the monastery bakery. The equipment is German, since Russian technology is unreliable, says the cellarer. "Baking bread is a very complicated process. First, the leaven is alive. If there is a bad atmosphere around the group, the leaven doesn't work and the bread doesn't rise well. To bake custard bread, for example, you need 18 hours." In the last few years, entrepreneurs have begun showing interest in the goods produced by monasteries. These days there are growing numbers of stores that sell only natural products in Russia, and those stores nearly always have something that was produced in the monasteries. "Mass-market bread factories are interested not in the quality but in the quantity and price of the products," says Yevgeny Schepin, director of the Izbenka and VkusVill communications companies. "It’s like a mathematical exercise: you need to produce and sell as much inexpensive bread as possible in the least amount of time. For the monastery bakery, quality is a priority, which is why we work with them." Schepin's companies work with the Vvedensky Tolda Convent in the Yaroslavl Region. For the last two years the convent has been supplying Izbenka with bread, pies and gingerbread three-four times a week. Before the Soviet period, Russian monasteries were large producers of bread. In particular, the Spaso-Preobrazhenky Monastery on the Valaam archipelago in Lake Ladoga in northwest Russia, was one of the largest agricultural centers in the Russian north. On the 160 hectares of its arable land the monks would cultivate barley, oats, and rye; in the greenhouses they would grow melons and watermelons, and in the gardens – fruit and berries. The island had a drainage and irrigation system with canals that were almost 70 miles long. The monastery boasted a mechanical dairy farm with 70 cows and in Valaam's lakes the monks bred fish. Now, however, the monastery is turning toward Europe – the monks are learning how to make cheese according to Italian recipes. The monastery has the necessary equipment and the cheesemakers were trained in Italy. Such cheese is exotic for the monastery's refectory, which is used to simpler products: baked bread, sour cream, canned vegetables and mushrooms.